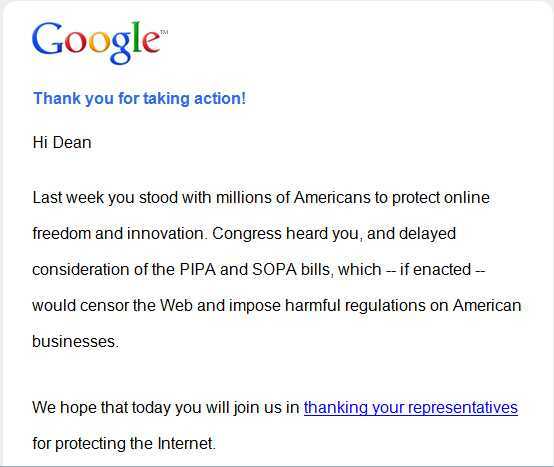 Did You Receive a Thank You for Standing Up Against SOPA? In a world with corporations that do not understand the value of a 1:1 relationship with their customers, customer service can be a trying experience. In the recent attempted hijacking of our Internet rights by politicians backing the SOPA bill, I was asked to take a stand. The request came from a number of big Internet juggernauts: will you sign a petition, write your congressman or congresswoman, will you stand up against this tyrannical power grab? My answer was yes so I wrote my elected representatives and signed petitions against SOPA. Of all of the organizations I supported with my efforts only one followed up after our stand. Only one took the time to write me a thank you email. 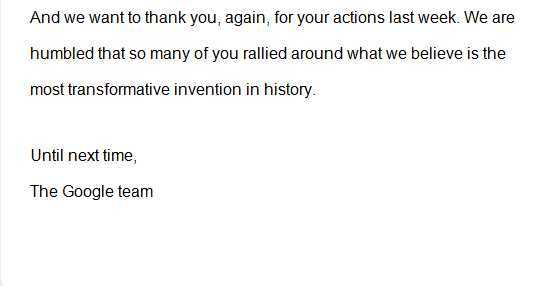 Only one was smart enough to recognize the power of a simple thank you even if it’s a mass blast email. Best of all it wasn’t from the big juggernaut I thought even knew I existed. Google’s announcement of sweeping changes in the Google search algorithm promises to be a huge breakthrough for social search. The long standing status quo of link building, back links, and SEO tactics both honest and dishonest are about to be far less meaningful to ranking in Google than ever before. With this realization of a sea change in search comes a new world where compelling content along with our social connections will be the new driving force behind SEO. 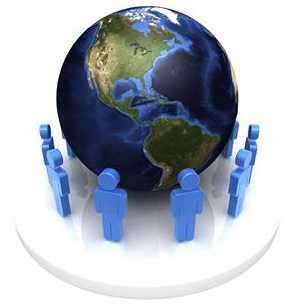 The first step in leveraging this new world is to understand how to curate and share content with your social network connections. If you don’t understand the relevance of Google+ to your ability to rank high in Google then you should consider reading Mike Brooks’ excellent post “Game Changer: Google Plus Changes Search and Social Media Marketing.” This post is your template and warning of where we are going and the importance of content and Google+. Without writing your own blog content, you or your company can still take advantage of the new Google search algorithm. Begin to investigate reliable and influential blogs, websites, news agencies, and social networks. Make your master list, share content that matters, and engage with your social networking friends and connections. Just do it! Google is the most influential force behind the proliferation of social media. Yet many of us think we know everything or close to everything we need to know about Google. In an eye opening article by Search Engine People’s Ruud Hein “20 Things You Don’t Know About Google” you can learn something new and in most cases be very surprised at what you did not know. Here is Ruud’s list and my impressions. 2. Google’s advertising revenue in 2008 was $21 billion; dg: incredible and more than I imagined! 5. The first Adwords Select ad was in 2000 for live mail-order lobsters; dg: you have to start somewhere, a precursor to WebVan? 11. In the last 10 years Google’s latency has gone from 1000ms to 200ms. 12. In the last 10 years Google has made seven major rearchitecture changes. 14. Google cataloged its trillionth web page in 2008; dg: with one trillion cataloged web pages will any company ever challenge Google’s supremacy in the search industry? 15. To translate one sentence Google does a million lookups in a multi-terabyte data structure. 16. To punish itself for artificial link inflation (paid links) Google penalized itself in 2009 by lowering the PageRank of it’s Japan domain from PR9 to PR5; dg: why not across the board? 19. To encourage developer teams to move to new servers Google uses auctions where teams bid how many extra computers dedicated to their service it would take for them to move; the lowest bidding team wins. Twitter’s Conversational Search: The Search Google and Facebook Seek to Emulate? The new buzzword in the world of search, and a concept being posited as the downfall of Google, is “conversational search.” The idea being that searching within Twitter, Linkedin, or other social media network search engines is a more robust and valuable search strategy than utilizing Google search. The thought is that the search results on Twitter could lead the searcher to conversation(s) that provide more targeted information, possibility of immediate communication, and feedback. The following is a retrospective look at our original Twitter case study that highlighted David Murray’s successful job search utilizing Twitter.com as his main tool. Within Dave’s strategy were 5 major tips that any job seeker can use to begin the process of delivering their value to their strategically targeted audience(s). This is a fantastic case study for the value of conversational search: injecting yourself into your desired conversation resulting in an opportunity. Use Twitter: This sounds easy but the first step is to recognize that if you want to stand apart, you need to begin to utilize social media tools your competitors may not be using–yet. Create Keyword List: List all of the keywords for the company, industry, people, and niche you wish to “follow” on Twitter. An example of David’s keyword list: “Social media jobs”, “Online Community Manager”, “Blogging jobs”, “Hiring social media”, and other keywords that fit his job search criteria. Twitter Search: Twitter Search is an internal search engine that you will input your keywords into to find conversations by people who are connected to the industry, jobs, companies, and niches you wish to contact. Another victim of the LandAmerica debacle, Vivian Hays, has stepped forward to lend her voice of warning. If you are new to the Ed Okun 1031 Tax Group swindle or this latest bankruptcy by LES aka LandAmerica’s Exchange Service, consider these stories a warning. Perform extensive due diligence before taking on any 1031 exchange investments. Good luck to all! People really need to be warned that anyone planning such a transaction is completely without protections or safeguards under any current law. Once caught up in purposeful fraud, or bankruptcy by the 1031 “accomodator”, you will likely never get your money back, or get pennies on the dollar. The victims of this blatant money grab are in for a huge, costly, gut-wrenching fight in a system they do not understand and cannot afford. Senators do not return phone calls, Congressmen are “not available” ( all but Senator Dodd, thank you very much!) the IRS has no answers, but attorneys are very happy to talk with you…for $300 to $500 per hour…plus expenses….so take warning and do not believe anything you are told by an exchange rep…they are probably lying to you and will not be held responsible even if they are. My money was taken in by LandAmerica 5 business days before they closed their doors. They did not even send me my paperwork, I have had to request it from the title company. These people were grabbing all the money they could and knew that they were going to declare bankruptcy, but we, their victims, will be held to contracts that they do not have to honor, and that the parant company supposedly fully guaranteed. My business is probably sunk, my health insurance, which I must have due to diagnosis of breast cancer will probably be lost, and I still have to try and pay a tax bill on money I will probably not ever see, and I may not even be able to write it off as a loss, since the claim won’t be in the same tax year. Mine is only one of the many, many sad stories. I guess I am about to find out if justice is really blind.